The Rectangular Enviro Dining Tables are high quality, lightweight tables, made from heavy gauge structural aluminium extrusion, ensuring maximum strength and durability. 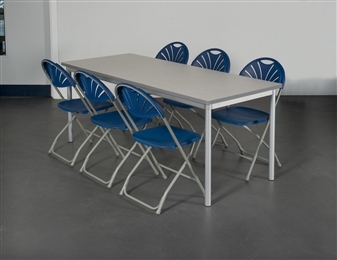 The tables are ideal for the school classroom, for canteen or leisure settings, for breakout, dining and restaurant areas, or for banqueting or catering events. With aluminium being 60% lighter in weight than mild steel, these tables offer a solution to the potential back injuries incurred when moving other heavier weight tables. Their lighter weight also means they require less energy to transport them. In addition, with aluminium being 100% recyclable, and recycling aluminium requiring 5% of the energy needed to produce fresh aluminium, these tables offer an environmentally sound product too. The tables are available in a choice of bright, durable, wipe-clean laminates with contrasting coloured edging, and with a choice of 2 heights and 3 different frame colours. There are 3 sizes of table with corresponding Enviro Benches available too (see Related Items below). 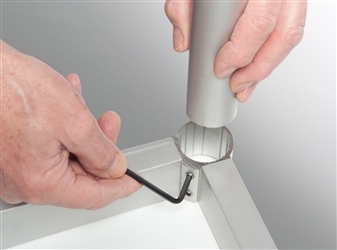 The tables come flat-packed and are assembled by connecting the table legs to the frame using a simple allen key fixing. The tables come with a 5 year guarantee and are British made. Minimum order 5 tables. 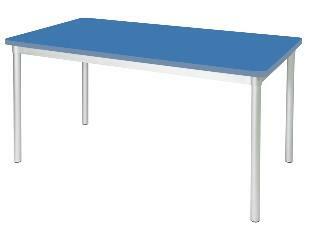 Ideal For Schools, Breakout, Canteen Areas Etc.